The Mr Pea Sheller is an affordable and easy to use pea and bean sheller and a perfect tool for the small gardener. Put the pea pods in, turn the crank and each pea will be pushed through the side of the pod. The empty hull will be ejected out the other side at the end of the process. Easy peasy! Designed out of steel with nylon mesh rollers, this device simplifies the traditional two thumb method for getting to your home grown peas. 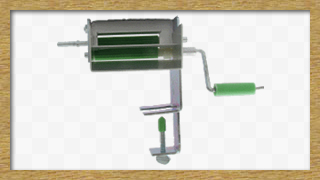 It has a two spline roller that separates the peas from the pod, allowing the peas to fall undamaged into a pan. A clamp that utilizes a single screw safely attaches the device to most tables, stabilizing the process. And to avoid damaging your surfaces, the Pea Sheller comes with a protective screw. You can even take Mr Pea Sheller to the next level by attaching it to a standard electric hand mixer. You have now automated the device, no longer needing to hand crank. You can either hold the pea sheller to ensure it doesn’t shake the screw lose or check on the screw every 10 to 15 minutes of operation. For the price, the device will more than pay for itself as it makes gardening easier and fun. The pods should be spread on a sheet or blanket at least six to eight hours before shelling for best results. Beans and peas that mash are likely contained in pods that are too tough due to growing conditions or could be too green or dry. Blanching these veggies and then cooling them in cold ice water for a full minute can help. You can then feed them wet into Mr Pea Sheller and get satisfying results. Try to not feed more than one pea pod at a time, otherwise you risk making the roller difficult to turn. Produce should always be fresh and green and not too wet. This could lead to the peas getting mashed. While you should expect a few peas to get mashed in the process, if all factors are in their proper place, the vast majority of the peas will come out perfect, ready for preserving or cooking. Overall, this hand style pea sheller machine will take your gardening to all new levels. With the capacity to upgrade it to an electric tool by using a simple electric mixer, Mr Pea Sheller is easy to use and well worth the investment.